Follow the trail of lollipops and gum drops to a sweet birthday celebration! 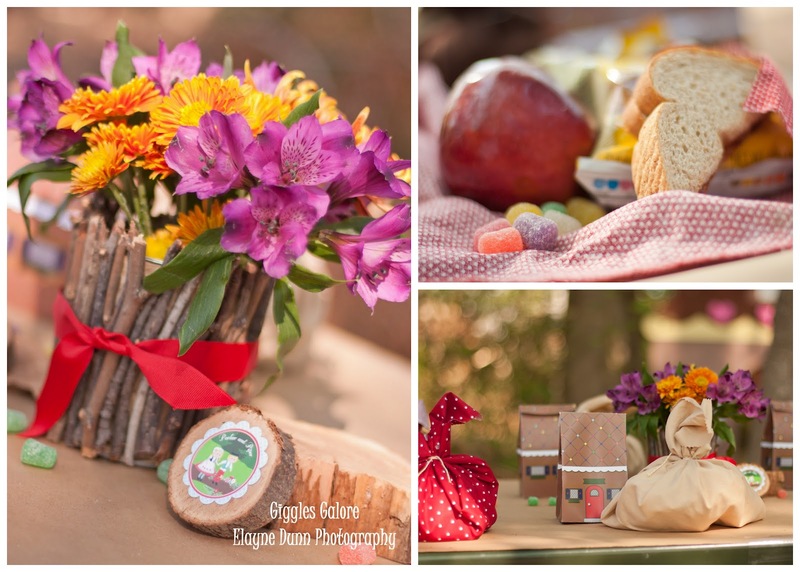 Venture into the woods for this fairy tale Hansel and Gretel inspired 4th birthday party…or as my twin’s called it their “Handsome and Gretel” party! When I asked my twin’s what kind of party they wanted for their birthday they both screamed “CANDY!” As an event planner and stylist I am always looking for ways to put a different spin on party themes and incorporate unique ideas where I can add my personal creative touch. I wanted to honor their request for candy, but didn’t want to host the typical candy party chocked full of sugary sweets (I most likely wouldn’t even let them eat.) One afternoon while looking at a kids cook book we had checked-out from the library inspiration hit and the idea for a Hansel and Gretel party was born. Party Details: I wanted to incorporate as many details from the story as possible and create a fairy tale setting ideal for my twins birthday celebration. I hosted our Hansel and Gretel party at a local park with lots of trees and natural elements to recreate that woodsy scene from the story. I worked with Anders Ruff to bring my vision for this party to life and used the printables to add whimsy and charm to our rustic outdoor setting. Decorations: One of the focal points was the life size cottage my husband created from cardboard boxes. It was set back in the woods and provided lots of giggles and entertainment as the kids pretended to raid the witch’s cottage. I wanted to play up the natural elements of our setting and chose to keep decorations simple. Tables were covered in brown craft paper from the Dollar Store and pops of color were added with the gumdrop trail scattered down the table, the candy cottages and fabric “hobo” lunch sacks. My dad cut tree stumps for me to use throughout the party and one of my favorite uses was my tree stump cupcake stands. Food & Sweets: Before diving into all the sweets our party guest enjoyed a simple lunch which was wrapped in fabric “hobo” sacks. Hansel and Gretel were sent into the woods with a simple sack of bread and I decided to echo this part of the story with our simple lunch of PB&J, fruit and a bag of chips. After lunch we ventured “into the woods” for birthday cake and sweets. I combined natural elements like moss and tree stumps with the colorful sweets. The store bought chocolate cake was transformed into a beautiful display with the amazing fondant Cottage and Hansel and Gretel from Love and Sugar Kisses. 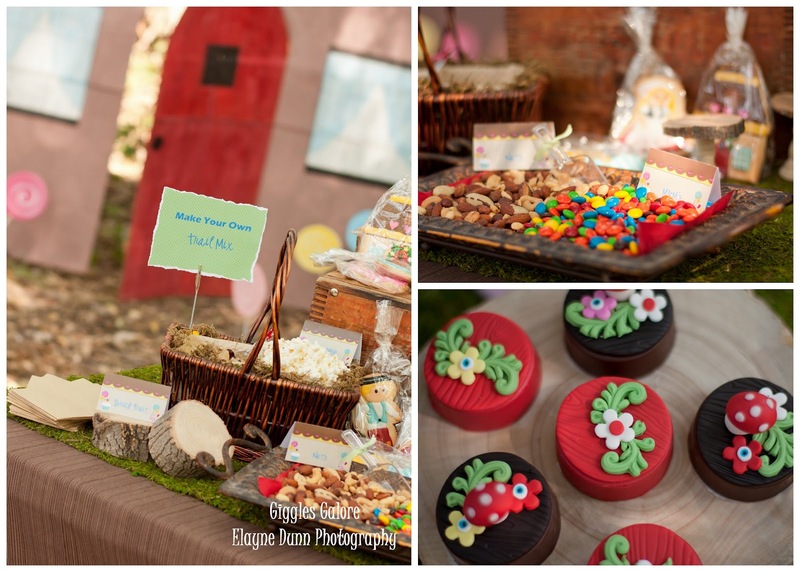 I loved all the details like the trees and mini lollipops she created to help bring the story to life on our cake. The colorful cupcake toppers added a touch of whimsy and looked so pretty sitting on my rustic tree stump cupcake stands. Love and Sugar Kisses also made the woodsy chocolate covered Oreos that were scattered around the table (and tasted divine!) I love ordering cookies from Sugarlilly Cookie Company, her attention to detail is amazing and these cookies were no exception. I couldn’t get over how adorable Hansel and Gretel were and that cottage was AMAZING! Guest could also fuel up before they headed back out to the woods with a “Make Your Own Trail Mix” station. I provided small brown paper sacks for the kids to fill with nuts, M&M’s, dried fruit and popcorn before heading back out to explore in the woods. A party isn’t complete without lots of fun activities and giggles! Come see how I brought the story to life and kept the kids entertained here. A HUGE Thank You to all the amazing vendors that helped bring this party to life. With only 2 weeks to plan, design and prepare I am beyond grateful for your contribution. How cute! First one I have seen! great job and as long as the children had fun on their birthday then SCORE! You have managed the party with perfection. 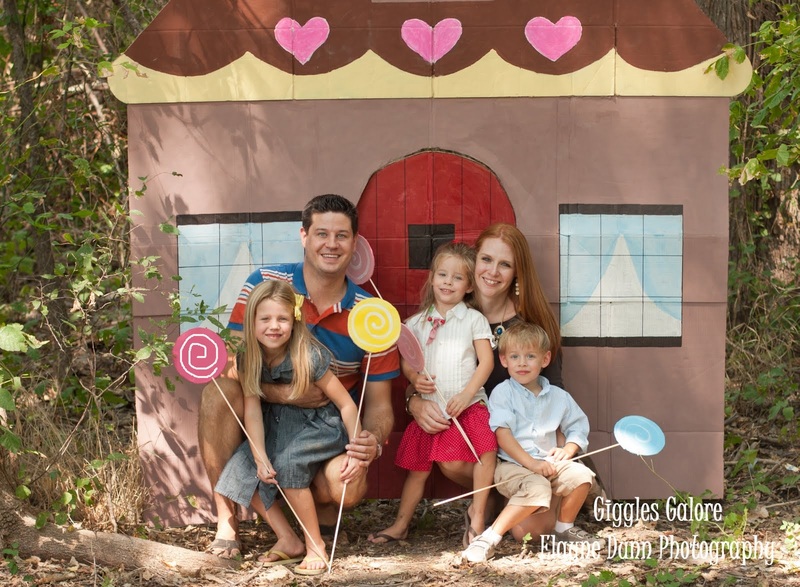 i am going to manage kids birthday party Boca Raton for my kid in an upcoming week. I'll try to follow the theme you created. Absolutely adorable, Mariah! I love the setting and I love the theme … so cute! Adorable once again great job! I bet they had so much fun. So adorable!!! You did an awesome job and what an original take on the candy theme!! I love the setting and theme. I love how you incorporated the theme throughout the party. Whenever I visit your blog,I am always inspired & motivated by you. What an amazing party! I love it all but more especially the stump cupcake stands 😉 genius ! You are so talented and once again you created a stunning party. You did a fabulous job!! Love the woods and the setting! I love this theme and all the rustic little details…great for a woodland fairy party too! Oh I just love it, esp the cardboard house, the cake, and all the woodsy and whimsical details! Love it Mariah!!! 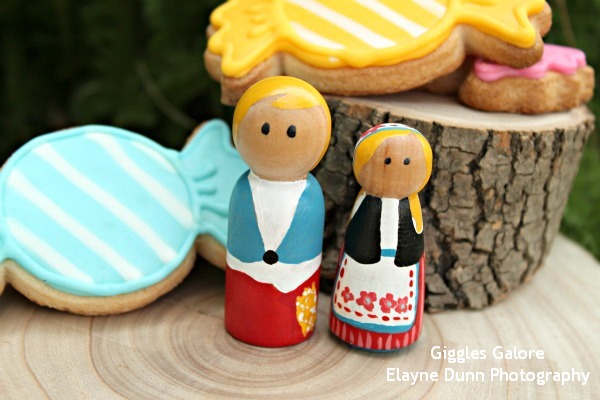 So many cute cute cute details! I think you thought of everything! Super fab, and truly HANDSOME kiddos. So CUTE!!! Whimsical and magiCAL… great job! So darling, Mariah! I love that the theme was unique and everything turned out so cute! The cardboard house is so cute and the cookies & fondant work is amazing!! Mariah…it looks GREAT!!!! What a wonderful party!!! love all the details Mariah, and the cookies, toppers and cutest cupcake stands ever! Super Cute!!! I love it all! This is stunning! Those cookies are to die for! Really, every detail in fantastic. Love, love, love your blog! !